Magnum Bumpers by ICI crush the competition when it comes to style, quality and design. Magnum Bumpers are designed in the U.S.A. by engineers who enjoy off-roading as much as you do. ICI bumpers are designed to flow seamlessly with each truck’s unique styling, and then carefully crafted for a perfect fit. Magnum Bumpers are made from the finest grade cold-rolled steel. Each bumper is treated with ICI’s proprietary, three-stage powder coating process. The final result is a matte-black, textured finish that will withstand the harshest climates. 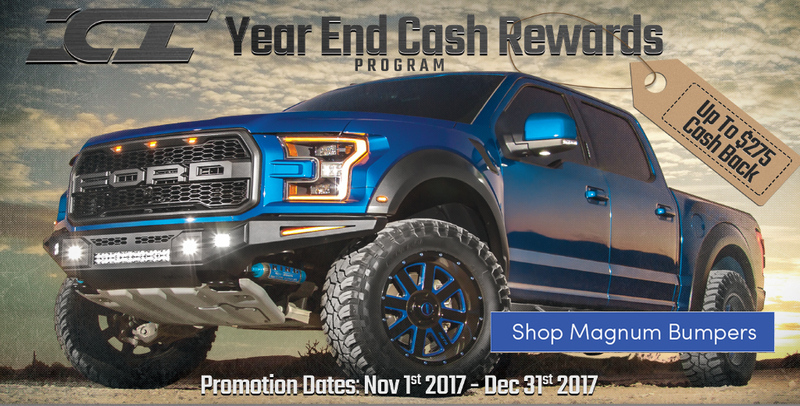 ICI Magnum front bumpers have all the features you want in an aftermarket bumper including winch options, recessed light hole pockets, shackle mounts and light bar or grille guard options. Magnum Bumpers are compatible with front and rear sensors, including cross-traffic/blind spot sensors! ICI is the first aftermarket bumper manufacturer to offer bumpers with cross-traffic sensors. ICI Magnum rear bumpers also accommodate the factory hitch and exhaust. ICI takes it one step further to make sure the product you receive is in perfect condition. All of the ICI Magnum bumpers are shipped in a custom built, wooden crate to prevent any damage during shipping. This is another way that ICI goes above and beyond to provide you with stylish, top quality product.